The Chairman, FUNIS Board and member, Governing Council of the University, Chief Olukayode Akindele, has described education as the bedrock for socio-economic development, which makes man easy to lead but difficult to enslave. 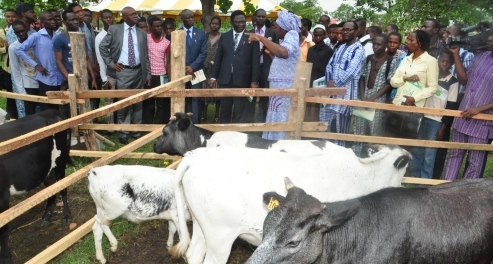 Delivering his address at the 8th Speech and Prize Giving/4th Valedictory Ceremony of the Federal University of Agriculture, Abeokuta International School (FUNIS), titled, “Fly High and Soar Above Barriers of Life”, Chief Akindele stated that the way out of poverty and social deprivation is through the walls of the classroom. “It is important to choose a good school to enhance the capacity of a child to make the most out of his/her destiny,” he said. Chief Akindele expressed delight at the quality of the graduating class of 2013, charging them to add value to their prospective tertiary institutions and the society at large. “I have a strong conviction that with this kind of foundation, these are gems that will surely make positive impact in the world in no distant future,” he added. Chief Akindele, who is also the Special Adviser on Economic Matters to the National Chairman of the People Democratic Party (PDP), commended the Management and Staff of the School for their untiring efforts and commitment at nurturing the students and for the quality of time and resources they had invested in them. He charged the graduating class to diligently apply themselves to learning and to always crave for more knowledge, to broaden their horizons, as he advised parents to desist from imposing their choice of career on their children. 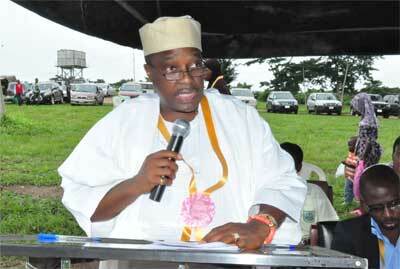 The Chairman of the occasion, Engr. Adewale Bolaji Osifowokan, said he was proud to be associated with FUNIS, describing the School as a place where children are well- tutored to be complete individuals. Delivering the lecture titled, “The Challenge of Being the Best Among Equals in Education”, a Chief Lecturer at the Federal College of Education (FCE) Osiele, Mrs. Oluyemisi Famuyiwa, condemned the habit in which parents and guardians encouraged examination malpractices among their wards, in a bid to secure admission. She said such actions were partly responsible for the mismatch between certificate and performance that had been blamed for the poor academic acumen of graduates. She said education is a vital tool for individuals to achieve their dreams in life, as she called on the graduands to acquire the necessary knowledge which will assist them in fulfilling their aspirations by contributing their quota to the development of the country. She noted that there was no short-cut to success, as she charged the graduands to work hard and be honest in all their dealings According to her, “In life, you should be prepared to face challenges just like the story of the Biblical Joseph but like him, hold firmly to your dream, believe and you shall achieve it”. Mrs. Famuyiwa, whose area of specialized is Curriculum Development and Evaluation, highlighted the challenges that youths often encountered on their way to success to include unstable school system, poverty of parents, negative peer pressure, abuse and health-related issues. Giving a brief history of FUNIS, the Acting Principal, Mrs. Emily Okpete, disclosed that the School was founded in September 2004 in fulfillment of the vision of providing comprehensive secondary school education and morally sound young people. She further stated that the school is National Economic Empowerment and Development Strategy (NEEDS) and Millenium Development Goals (MDG) compliant and in tandem with the National Policy on Education guidelines. She described the Speech and Prize Giving-day as an occasion set aside to reward hard work and diligence. Prizes were awarded in various categories such as Academic awards for JSS 1 to SSS 3 classes, Behavioural awards and Best Teacher awards. Dignitaries present at the occasion included HRM, Oba (Dr) Samuel Olufemi Ojugbele Obasogun III, Onilogbo of Ilogbo, who was the Royal Father of the Day; the Chaplain, FUNAAB, Professor Christian Ikeobi; the Parent Teacher Association (PTA) Chairman, Mr. Wole Babajide and the Deputy Director, Establishment Matters (Senior), Mrs. Oluwatoyin Dawodu aside past and present members of the School’s Board and representatives of the Principal Officers of the University.